Located in the north-central portion of the United States, in the Midwest and Great Lakes regions, Wisconsin is one of the country’s most beautiful states and the ideal locale for the sport of mountain biking. Wisconsin is bordered by Minnesota to the west, Iowa to the southwest, Illinois to the south, Lake Michigan to the east, Michigan to the northeast, and Lake Superior to the north, and is second only to Michigan in the lengths of its Great Lakes coastline. By total area, Wisconsin is the 23rd largest state in America and the 20th most populous. Its state capital is Madison, and its largest city is Milwaukee, which is located on the western shore of Lake Michigan. The state is divided into 72 counties. Wisconsin is divided into a number of different regions, including the Northern Highlands, the Central Plains, the Western Upland and the Lowlands that stretch all the way to the shores of Lake Michigan. This diverse geography offers a number of great mountain biking opportunities to suit every level of rider. To illustrate these opportunities, below we have highlighted five of the state’s most popular mountain biking trails, and provided a brief description of each of these well-ridden courses. 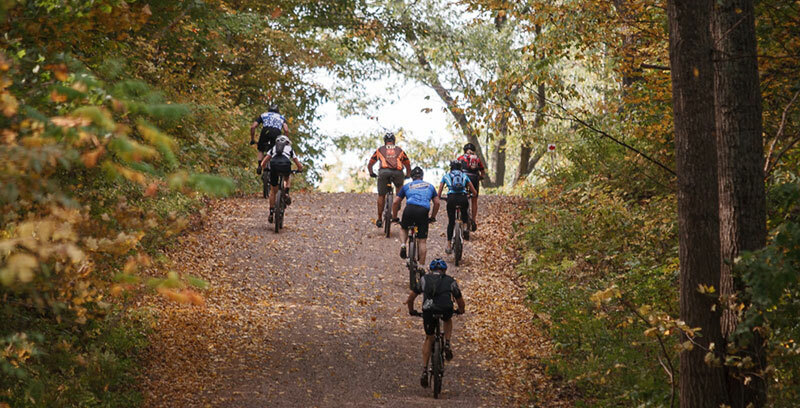 Located in the town of Bloomer, Wisconsin, the Hickory Ridge mountain biking trails offer a truly entertaining riding experience for cyclists of all ages and ability levels. At Hickory Ridge riders can enjoy an intermediate-rated single track course spanning roughly 11 miles in length, or the less technical double track course that is perfect for beginner/novice riders. The trails system at Hickory Ridge is contained entirely within a large tract of Chippewa County forest land—land that has been utilized for all types of recreational pursuits over the years, including hiking, camping, fishing and more. The Chippewa County forest offers a technical mountain biking experience like no other. The utter wilderness that surrounds these trails enables riders to experience a truly wonderful off-road cycling adventure, one that winds through through steep hills and valleys, over rocky terrain and circles the area’s many glacial lakes. It is with the cooperation of a group known as the Friends of Hickory Ridge that the mountain bike trail system was started here several years ago. The topography, soil type and landforms also make this area perfect for future mountain bike trail development. CORBA, the region’s mountain biking association, has already begun investing a lot of time and energy into expanding these trails, as the considerable acreage makes the area ideal for epic single track experiences. In this same patch of forestland, outdoor enthusiasts will also find plenty of wintertime recreational opportunities to keep them busy when it’s too cold and snowy to ride, including 27 kilometers of cross country ski trails that are expertly groomed and maintained by the Friends of Hickory Ridge. Situated in the town of East Troy, Wisconsin, the trail system at Alpine Valley includes a hair-raising, black-diamond, expert’s course, measuring five miles in total distance when ridden as a loop. The Alpine Valley expert’s loop is designed to be ridden in a clockwise direction only. The initial mile of the course is fairly straight and involves a rather grueling, yet steady climb that takes riders up approximately 800 feet of gorgeous mountain terrain to the apex of the course. At the top of the course, many riders will choose to stop and gaze out at the beautiful valley below before beginning their descent—a fast, breathtaking drop that will test even the most expert riders. The remainder of the course consists of flowing single track, complete with all the obstacles one would expect on an advanced-level course. Some of these obstacles include river crossings, roots, rock gardens, and switchbacks, in addition to the many manmade skinnies, berms, jumps and bridges. Due to the often treacherous nature of this exhilarating course, riders are urged to wear helmets and other protective gear when tackling it. The Sugar River State Park Trail extends from the town of New Glarus to the city of Brodhead, passing the villages of Monticello and Albany along the way, both of which make for excellent stopping points in which to rest, recharge and take in some refreshments. When the trail bed at Sugar River was originally designed by the railroad, it went around the adjoining hills, thus making many large curves on the trail, which collectively have made it one of the most well-loved trails in the state. The Sugar River State Trail opened in the mid 1970’s as the second state trail in Wisconsin. Over time, the natural flora has grown considerably to provide a lot of shade on the trail—a popular amenity, especially during the warmer summer months. Located in the town of Cable, Wisconsin, the Rock Lake Trail spans over 12 miles in total distance, or 25.5 miles when ridden as a loop. Rated intermediate in terms of difficulty, this IMBA Epic trail is one of longest “skinny-trail” courses in the Upper Midwest region of the United States. The trail consists mostly of flowing single track, although there is a spattering of wider sections and brief double track interludes. The Rock Lake trail offers something for every level of rider: hard-charging experts will find an abundance of great obstacles to challenge them along the route, including jutting roots (some of them very large), slippery hard-pack, berms, jumps and more. Intermediate riders may choose to back off the pedal just a bit and simply enjoy the course’s many great features and the scenery that surrounds it. The trail system is fairly simple to navigate, with each intersection labeled with a letter-number combination for easy identification. The Rock Lake Epic trail system begins at the Rock Lake trailhead. The route travels in a counterclockwise direction and includes the Rock Lake, Glacier, Patsy Lake and Namakagon trails. The trail is fairly easy in the beginning with only an occasional rock to avoid. A few rocky descents will be encountered as riders make their way further along the trail, all of which are navigable for at least intermediate riders. The middle portion of the trail is considered the most technical, and while experienced riders will have no problem tackling this portion at full-speed, less-seasoned riders may want to back off the pedal just a little until they are more familiar with these obstacles. Parking at the Rock Lake trailhead is approximately 7 miles east of the town of Cable and requires a small daily fee. Located near the tiny town of Wild Rose, Wisconsin, Nordic Mountain is an intermediate to advanced-level trail spanning roughly eight miles of gorgeous Central Wisconsin terrain. There are actually several areas of this trail that take riders both up and down the main ski hill at Nordic Mountain. The many switchbacks that are provided aid riders as they make the initial climb up the hill, an ascent that represents an elevation gain of 651 feet. Once at the top of Nordic Mountain, riders can sit a spell and enjoy all of the beautiful landscapes while resting and recharging for the remainder of the course. Once cyclists begin the fun-filled descent, they will find a track that is perfect for building up and mastering some of their bike handling skills, as they flow past roots, rock gardens, tight turns and other obstacles that make the course so entertaining. There is no charge for parking at or riding the Nordic Mountain bike trail.